James Beard Awards 2010 call for entries. I’m voting. You? Lincoln Center. Red Carpet. The adoration of fans, friends and professional colleagues. Oh, and the uptick in business doesn’t hurt either. No wonder so many chefs, restaurateurs, winemakers and food-shakers hope to someday wear the broad ribbon with James Beard’s face hanging on it. Winning a James Beard Foundation Award is a kick-in-the-pants, a professional affirmation and an exceedingly proud moment. Being nominated for one isn’t exactly chopped liver either — as these familiar folks will attest. Don’t believe me? Just ask Maria Hines. 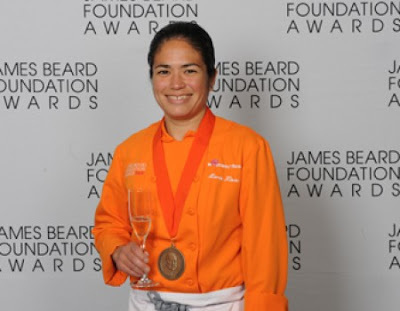 Maria Hines of Tilth, drinks a toast to a 2009 award-winning chef: herself! So, how does one get on the list of potential nominees? First comes the call-to-entry, now open to opinionated diners everywhere and accessible on-line by clicking (and registering) via this link. You may vote in up to 19 categories. Deadline for entries is December 31, 2009 and winners will be announced May 3, 2010 at the annual gala event in NYC, where once again I plan to be on hand, rooting for the home team.